This BotF correspondent avoids Darling Harbour as much as he can. Primarily because it is in the opposite direction to the ferry from my work, but also the restaurants and bars in this area tend to be of the over-priced, over-hyped but distinctly underwhelming kind. Worse still, I was probably going to have to pay. There’s a relatively new precinct underneath the two new Commonwealth Bank buildings, and an array of these restaurants have sprung up. One is Braza Churascaria. Now I’ve got to say that this looked like a barn-like nightmare, but ended up being a great place. 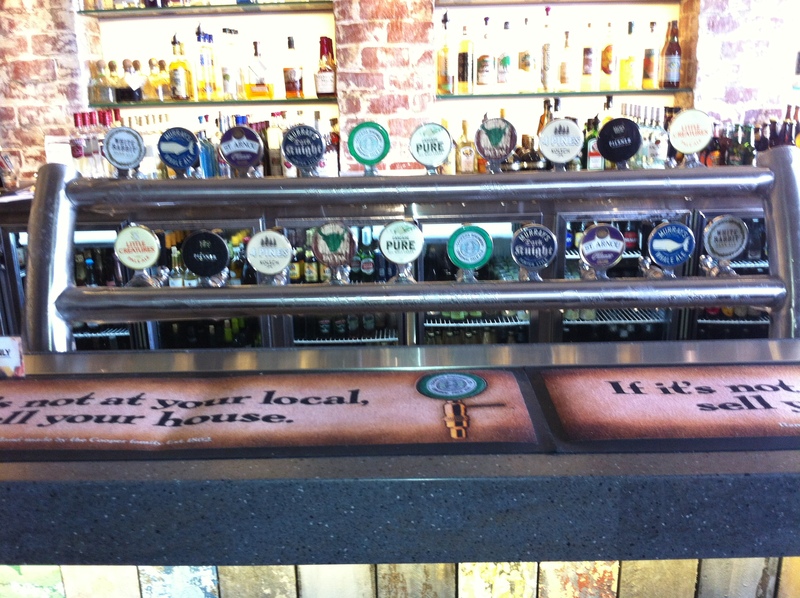 Of particular surprise was a great beer menu and, for the type of establishment, a good tap rack. The impressive rack has 20 taps with 10 taps and includes Murray’s Dark Knight and Whale, White Rabbit Dark, Moo Brew Pilsner and 4 Pines Kolsch. The beer menu has a very impressive range of bottled beers including at least two that hadn’t graced these pages before. 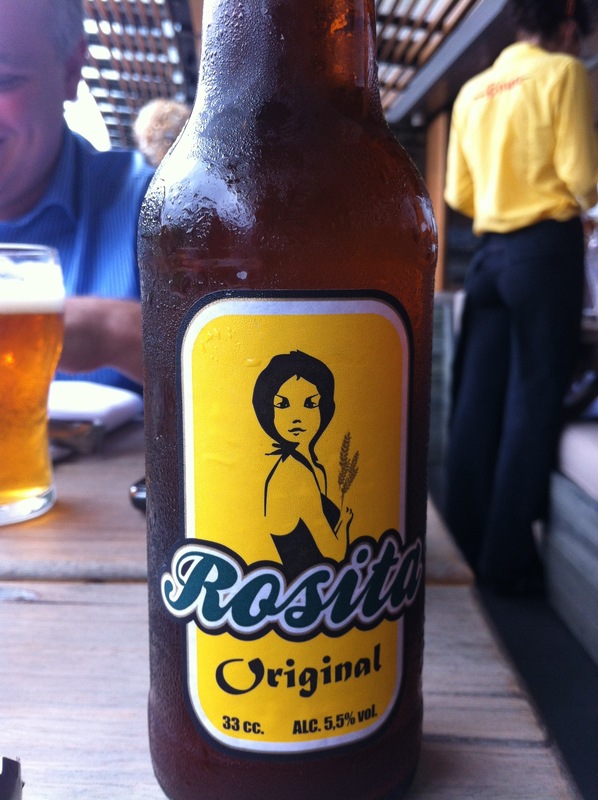 The first of these sounds so much better in Spanish – Rosita Cervesa Artesanal de Tarragona – or in English, Rosita Original. It has a beautiful label where the coquettish senorita is holding a couple of shocks of wheat. The website translator has a nice case of Spanglish and predicts your experience to be “Ones olfactory will detect fruit such as banana and red apple notes along with molasses which is very subtle but also very complex.” Euro swill this isn’t. That said, it isn’t a big beer, but it has plenty of flavour. It’s nicely hoppy without too long an aftertaste. Worth trying for sure. Tarragona is in Catalonia, but isn’t the home of tarragon. 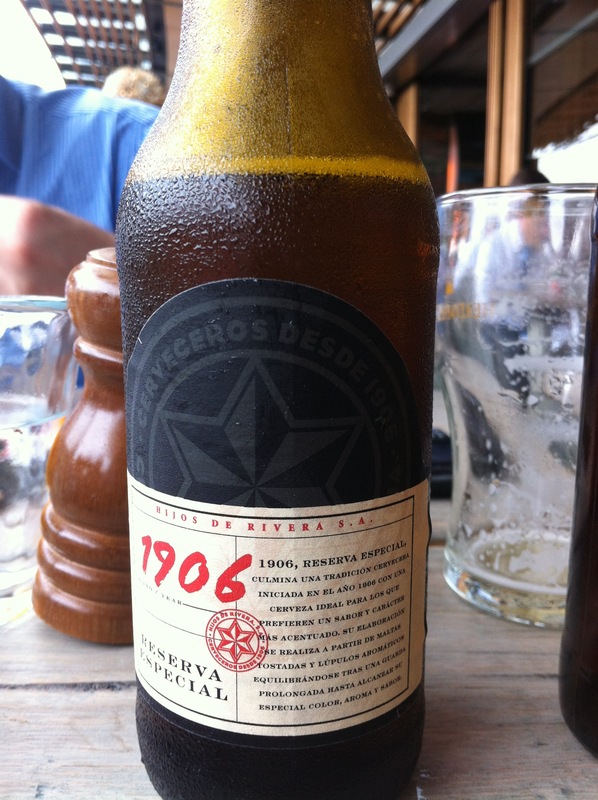 Hijos de Rivera Brewery is based in A Coruna, which is a major city of Galicia. Their flagship beer is Estrella Galicia, which is as much fun to say as Jose Maria Olazabol pissed or sober. This particular offering is a beer released to celebrate the brewery’s centenary. Beer Advocate classify it as a Bock and whilst it is 6.5% alcohol – it doesn’t have the chunky flavour and texture of a bock. It probably makes it more sessionable than most Bocks. It wasn’t a bad beer, but I think I’ll return to Rosita if I return to Braza Churrascaria. With a few minor exceptions , Spanish beer means lager, and those lagers are vapid beers designed, it seems, to be served cold and slake thirst, rather than actually taste of anything. They are, literally and figuratively, like pop. Ubiquitous in Madrid, Mahou – or Mapoo as its known in my house (eat your heart out Oscar Wilde) – is the worst of the lot . Where, say, Cruzcampo is so anonymous as to barely warrant comment, Mahou, particularly in its weaker, green label Clásica incarnation, is actively offensive: thin, inordinately frothy, cloyingly sweet. San Miguel , which, to me, has a peculiarly grainy, almost acrid aftertaste (due to the malt they use, presumably) is only marginally better, and, but for the pride that the Catalans take in it, Moritz is just more generic watery fizz.